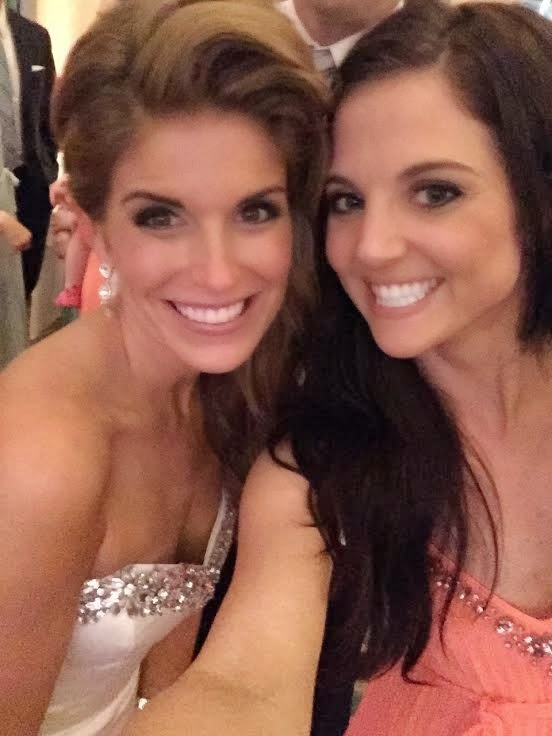 Here is Part 2 of 3 of some of my suggestions and lessons learned from wedding planning! I cannot stress how much time, trouble and possibly money you will save yourself by choosing a venue where most things are included. This is not to say you shouldn't choose your dream venue that offers nothing more than a field and a beautiful setting, but just know what you are getting yourself into. 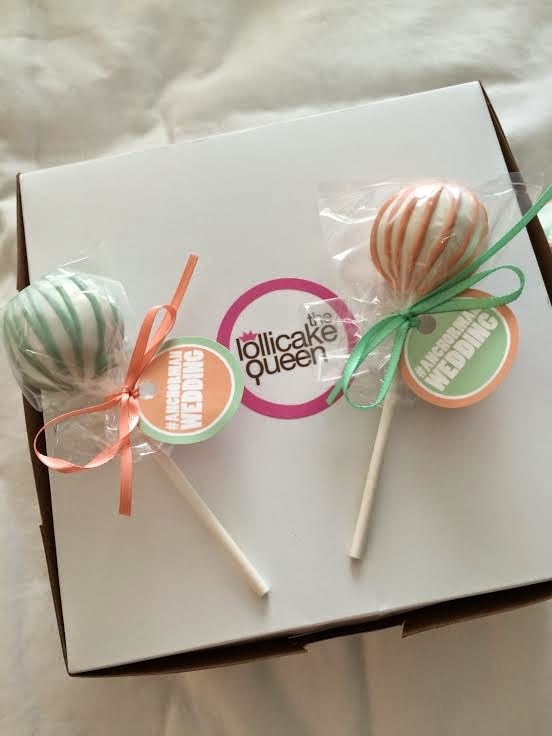 You will have to secure a caterer and some venues will charge you an often-large fee if you don't use their approved or preferred caterer(s). There's also the bar, the silverware, tables, chairs, linens, and possibly tents and a dance floor. Not only will you have to juggle and coordinate all of this, but each vendor will have their own delivery and set up fees. With deposits and final payments, and vendors preferring different payment methods, just paying these people will take time and organization. If you have a wedding planner, this will be much easier, but if not, you'll be in for a lot of work. Again, not to deter you, but just warn you. 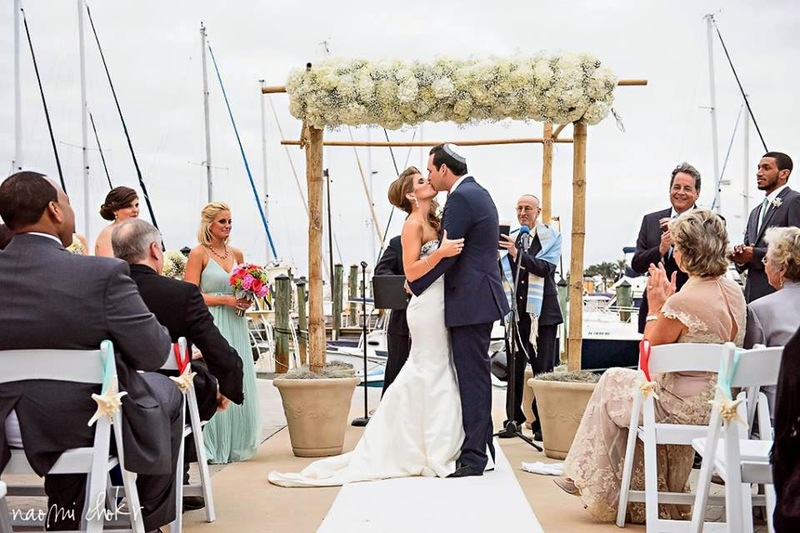 Our venue, the Sarasota Yacht Club, was priced per wedding guest, which included hors d'ouevres, dinner and alcohol. Of course the more extravagant you go on your meal and liquor choices, the higher the price is per head. So you can control your costs by paring down those things (one thing we cut was hot hors d'ouevres) and limiting your guest list. Per-person pricing was also nice because we didn't have to worry about reaching a dollar limit at the bar in the middle of the reception. Whether people drank one or 10 drinks, the price was the same. Linens, tables, chairs, etc. were all included. We were able to bring in our own florist, bakery and lighting company with no vendor restrictions. We did have to pay a fee to rent the ballroom, but we chose to pay a little extra and get a seasonal membership at the club, which covered our room rental (and four months of enjoying the club after the wedding). 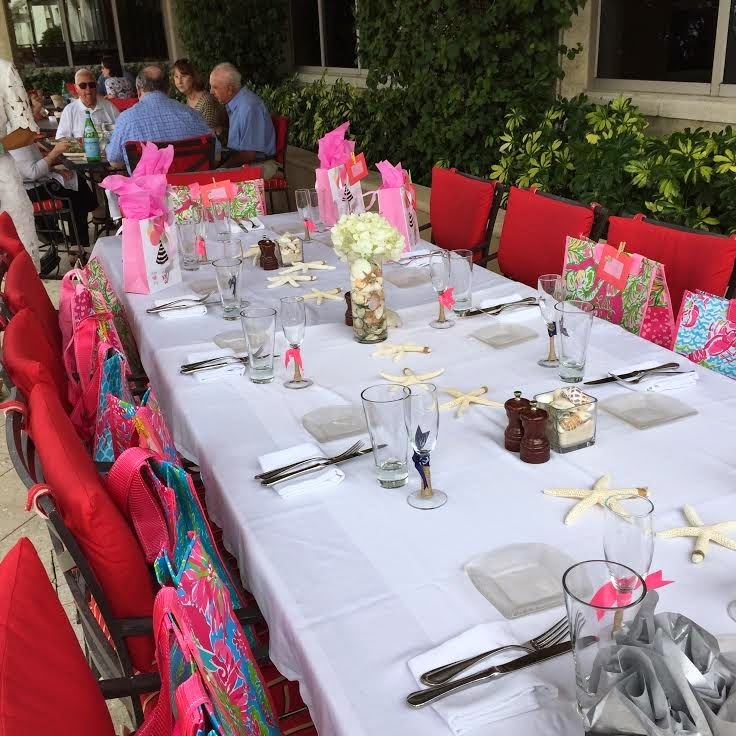 Other clubs may offer similar deals, and if you have a family member or friend willing to "host" your event, many clubs may give you a free room rental. -If you have outdoor elements, having a desirable rain plan will greatly reduce your stress. Life has a funny way of screwing things up, like rain on a date that hasn't historically had showers in 20 years. It's a no-brainer to have a rain plan in Florida, because despite being the Sunshine State, we also get a lot of rain, especially in coastal areas. If you live in a dry climate, you might not put much weight on a rain plan. But you just never know! If you do have a plan in place, it will prevent you from stressing and being a slave to the forecast. Trust me, you will have many more things to worry about the week of the wedding and you don't want the weather to be one of them! Our ceremony was outdoors near the marina at the yacht club, but our rain plan was to have the ceremony in the lobby of the club. The lobby is gorgeous and expansive, so I would have had zero disappointment having the ceremony there. 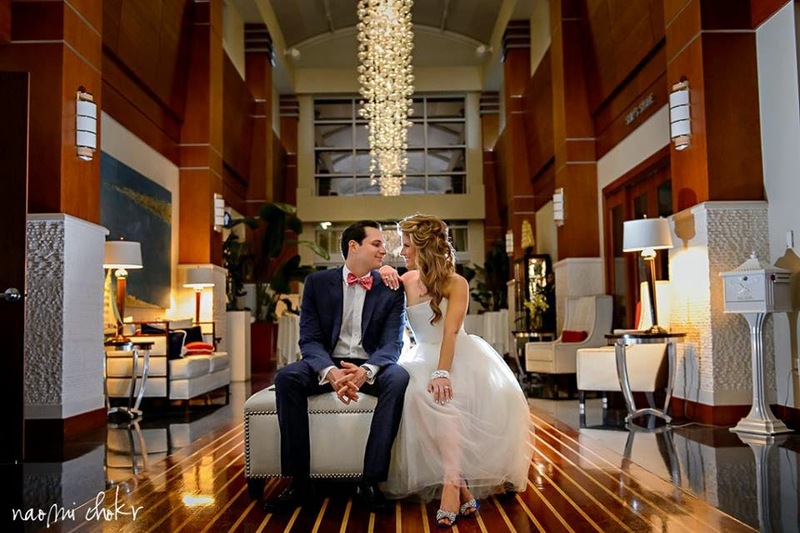 A venue with an easy rain plan will make your life that much easier! -Do you have to do toasts and speeches, or can you do them at the rehearsal dinner? At my sister's wedding, we did all of the speeches at the rehearsal dinner and it was the best idea ever, so we decided to do that as well. Only the people who know you the best will be at the rehearsal dinner, so they are much more likely to understand and care about all the funny stories. Plus, you'll be in a more relaxed environment and not as time-crunched, so more friends and family members can feel free to stand up in a less daunting environment. Also, you won't disrupt the flow of the reception or cut into party time. 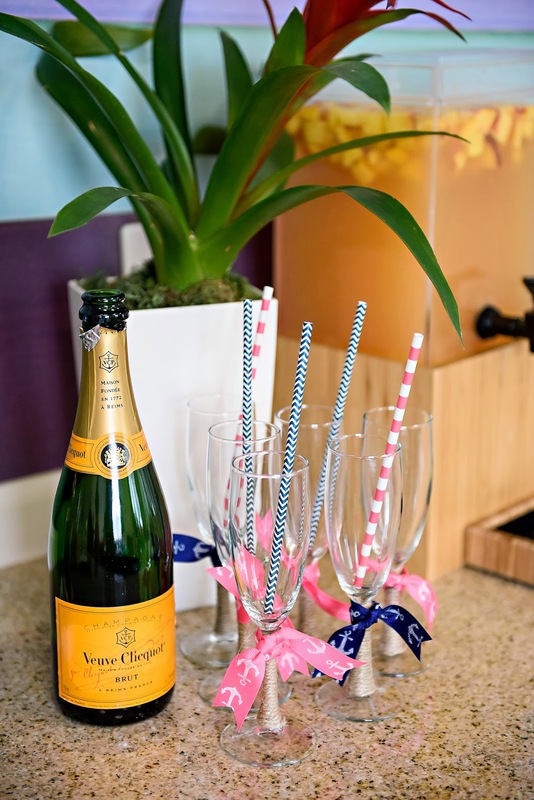 You may also save on champagne cost if your venue charges you to pour a glass for every guest. Our toasting champagne was actually complimentary, but since we were not doing a formal toast, I asked them to put that champagne behind the bar for guests who actually wanted to order it. There's a good chance when they pour champagne for everyone, many guests won't drink it. -Be flexible. Do not fixate on details. 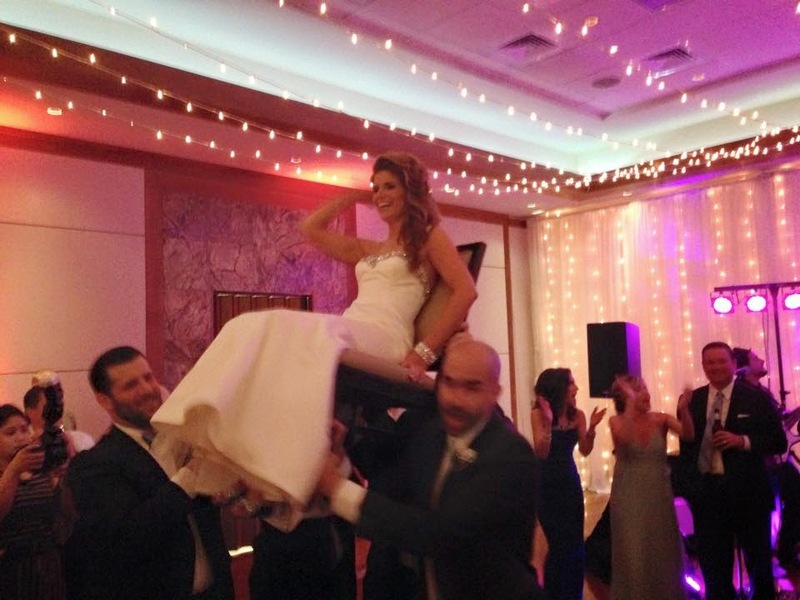 This applies to so many different aspects of your wedding. There is a good chance you've envisioned certain things, and when they aren't available, too expensive or just don't work out, you might be really disappointed. That's why it's important not to get wedded (pun sort of intended) to any small detail. Be flexible and willing to look at alternative options. I didn't suffer from this affliction, but I've heard many stories of brides "sweating the small stuff," and it's just not worth it! -But there are some details that really are worth the effort. In my dreamland where everything is stress-free and gets done early, I envisioned myself doing a few wedding-related craft projects several weeks before the wedding. Me doing craft projects is hilarious enough, doing them early is even funnier. So there I am on Wednesday night hot gluing, bow tying and seriously contemplating ditching the whole thing. 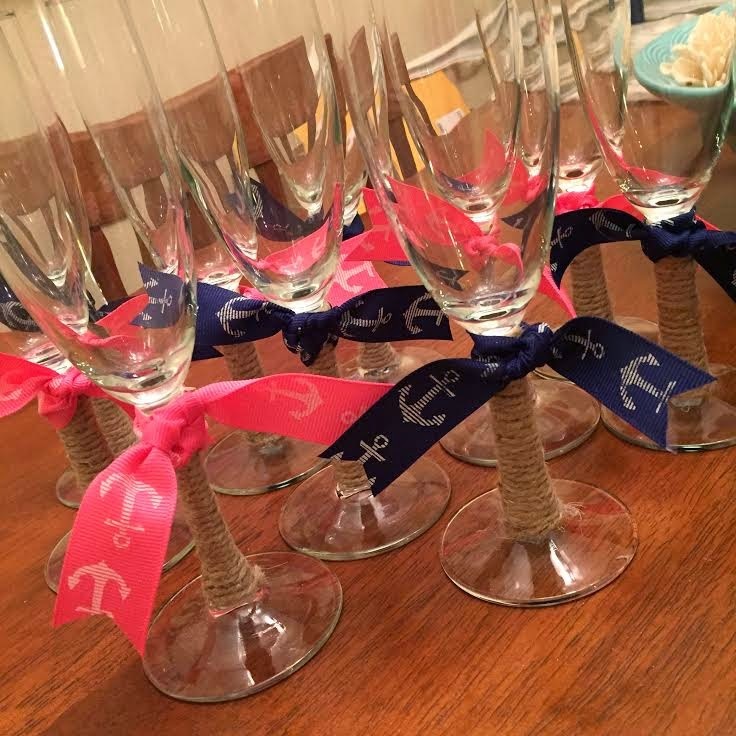 But my little Pinterest-inspired, nautical-styled champagne glasses were so darn cute, I made myself stick it out and get them done. I was so determined that even when I ran out of ribbon, I sent Max on a Walmart run the next day so I could finish the final few. Small additions, champagne glasses for me, maybe something else for you, aren't essential but they add to the overall experience of the weekend. 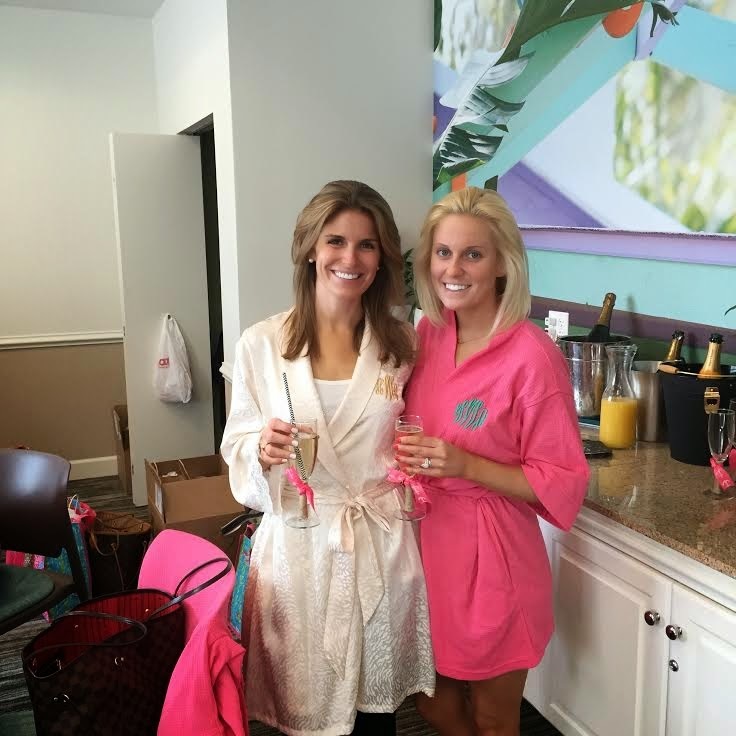 We used them at the bridesmaids luncheon and the day of the wedding. They added a fun touch and made for some cute photos. Most importantly, they made me smile, probably because I was so proud of myself for actually completing a craft project! Long story short, allow yourself to pick a few details that matter to you. I give Max all of the credit on this one. I didn't really think much about the lighting until Max kept saying, "I just want those purple lights." I had no idea what he was talking about! Then I realized he meant uplighting. We actually ended up choosing coral uplighting and twinkle lights, but the point is, we added lighting to the room. It really does make a difference, and it's highly-customizeable to your vision and budget. The lighting company we worked with in Sarasota, Affairs in the Air, was willing to do as little or as much as our budget allowed. This is one area that I suggest looking into even if you don't know how much room you have in your budget- even a little will make a big difference. -Hire the best photographer you possibly can. -Have an amazing Glam Squad. 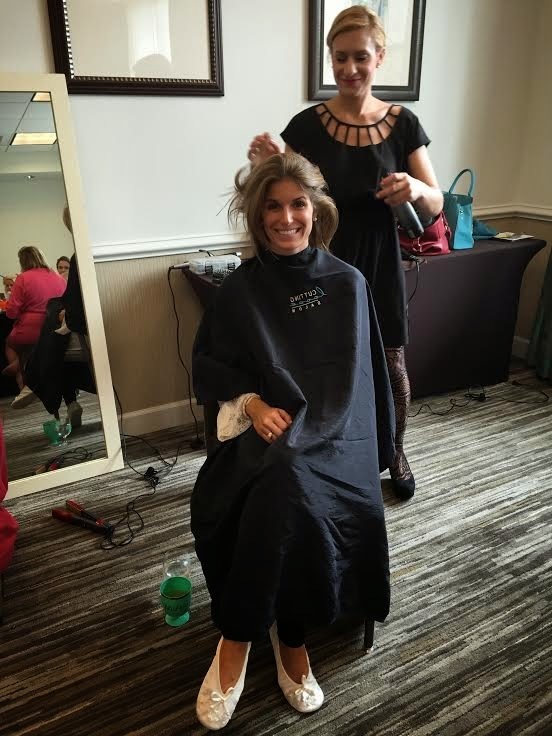 Uber-talented hairstylists and makeup artists are 100 percent essential. Julie Ann and Corinne, you rock my world. 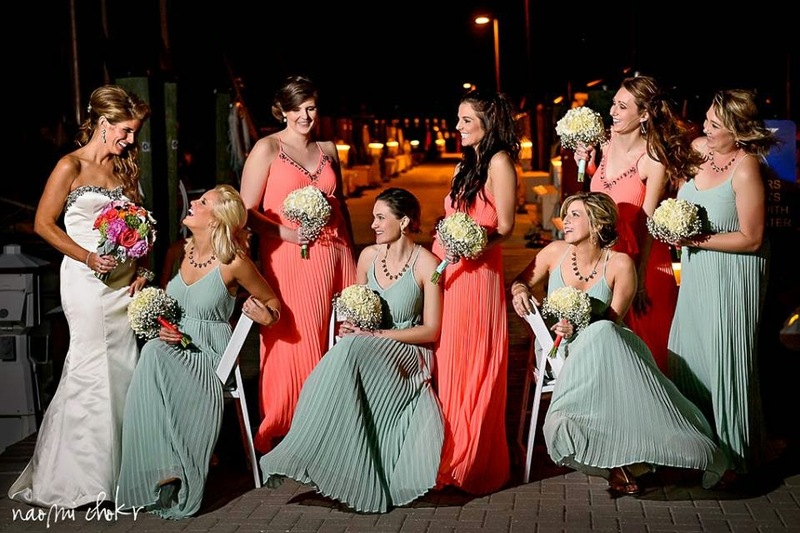 -Think outside the box on bridesmaids' dresses. Bridesmaids' dresses are notoriously difficult to choose. Not only are you making style choices for multiple people, you also have different height and body types, and some girls may be pregnant or just had a baby. You're also trying to stay with your season, theme and color scheme. If you go to a traditional bridal salon or bridesmaid dress store, it can be overpriced and full of typical bridesmaid-y dresses. Plus, your girls will probably have to send in measurements and go through the store to place their orders. On the other hand, if you choose the dress from any old store or online, you run the risk they'll be out of stock or won't have all the sizes you need. It's not ideal either way you slice it. 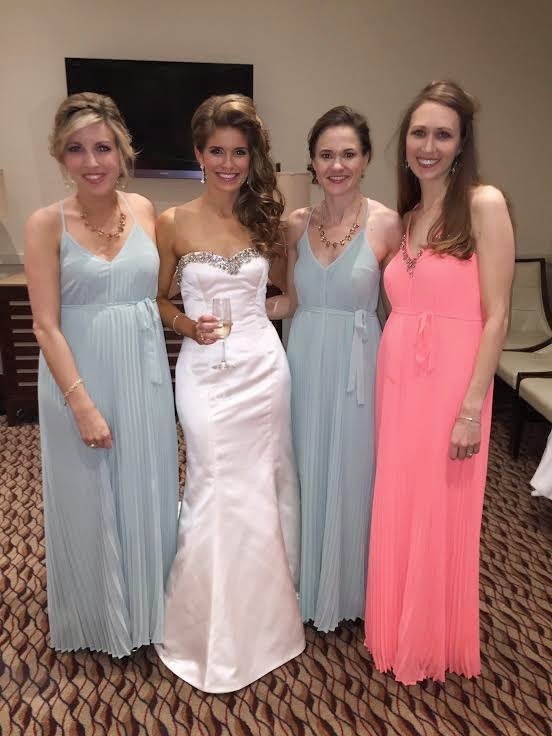 I went to one bridesmaid dress store in Atlanta and found some cute choices, but they were pretty expensive. So in the meantime, I was also looking around anytime I was out shopping and did some online hunting as well. I came across some dresses I liked in the Victoria's Secret catalog, so I called them to check on the inventory. They had plenty of sizes, so I knew that would buy me a little time to run them by the girls and make a final decision. A few days later I realized there was no point in continuing to look, so I had everyone send me their sizes and I placed the order. Four days later they were on my doorstep- done and done. Plus, they were on sale! -Consider adding some of your own vows even if you don't write a masterpiece beforehand. Never in a million years did I think I would say my own vows, but having an interfaith ceremony definitely changed things. Since we were basically handcrafting the service along with our pastor and rabbi, there was a lot of leeway in how we did things. In our ceremony, the rabbi was handling the vow portion, and I found out the Jewish wedding vows are very short. I didn't feel like we were vowing a whole lot. So I told Max I thought we should add a little something to the vows to make them more substantial. I kept thinking I would sit down and write something or at least have something in my head. To tell you the truth, I never really did that. I had so much anxiety leading up to the wedding that I couldn't focus my mind. So as my bridesmaids and I are two minutes away from walking down the aisle, I say to Analisa, "I have no idea what I'm going to say in my vows." And she said, "You really do pretty much know what you're going to say." It was such a simple statement that carried so much weight, that I will never forget that moment. She was so right, you're marrying the love of your life, you DO know what you're going to say because you're going to say what you feel. Fab 4 keeping me sane before walking down the aisle! Part 3 is coming soon and focuses mainly on your mental state, aka crazy bride brain, especially in those last couple of stressful weeks before the big day! We love what we do and that is why we have done it for over 25 years, but the best part of our work is getting to meet the brides and the grooms. some people say "how do you work with brides every day" well, I wouldn't have it any other way! And I meet some of the most wonderful people that way, Hayley and Max, you were sooo much fun to work with and it was a pleasure helping you with your special day. Congrats and we wish you a life time of happiness!, I am sure we will see you two around. You are so, so kind to say that! You BLEW US AWAY with how you went above and beyond for us! I remember taking photos down by the water the after the ceremony and telling Max, "look they lit the whole ballroom!" It was amazing. You guys are a Suncoast institution for a reason. Thank you again!